Ethel Rohan was born and raised in Dublin, Ireland. Her first story collection Cut Through the Bone was longlisted for the 2010 Story Prize. 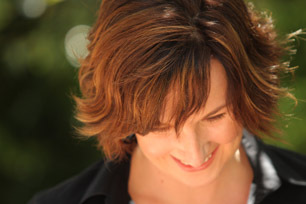 She is also the author of the chapbook, Hard to Say (2011). Her work has appeared in The New York Times, World Literature Today, Tin House Online, Sou’wester, Post Road Magazine, and The Rumpus, among many other publications. She received her MFA from Mills College, CA, and is a reviewer for New York Journal of Books and a member of the San Francisco Writers’ Grotto and PEN America. 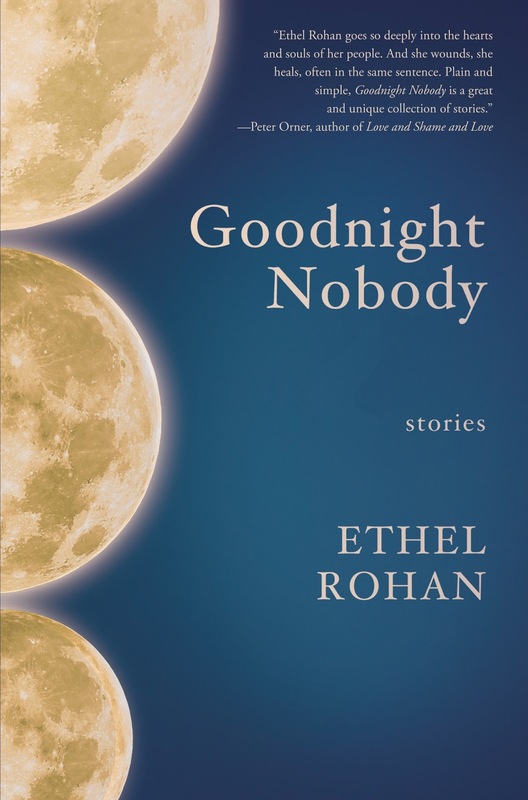 Her most recent collection of short fiction, Goodnight Nobody, was recently published by Queens Ferry Press. The title of your collection, Goodnight Nobody, struck a chord with me long before I even had the book in my hands – many readers will recognize the phrase as a haunting line from Margaret Wise Brown’s classic children’s book, Goodnight Moon. Can you tell us a little about what that line means to you? How did it come in to your story of a grieving husband - was it the inspiration for the story, or did it come later in the process? The title came later in the story process. I usually come to my characters first--a phrase, dilemma, some peculiarity--and the subsequent drafts reveal his or her story. "What if a garbage man finds a body in a dumpster?" That was the genesis here. "What if the corpse reminds him of another corpse? Who?" Those questions lead me to the protagonist's wife. So I've got a man and his dead wife, what's their story? When I pictured Sarah in kindergarten, I saw her struggling to read. What's she trying to read? At this point I thought maybe the story title would be Goodnight Moon. I wrote and rewrote until I arrived at the protagonist's nightly ritual. Goodnight Nobody is a haunting line and one that I felt was perfect for this story and for the collection as a whole. It struck me hard when I finished this story how much I take for granted the fact that I have a family to say goodnight to. What if I didn't? What about all those people who don't have anyone to share a life with, to say goodnight to and to hear goodnight from--not by choice but by cruel circumstance. In this book, I wanted to give the lonely and the left behind a voice. You are able to convey so much emotion in your (often very) short stories – what was your writer’s road to short fiction like? Have you always been a short story/flash fiction writer, or was it a form that came to appeal to you over time? What do you love most about the short format? I came the long way to short-short fiction. Although I've loved to write for as far back as I can remember, it was only when I started my two-year MFA in 2002 that I began a daily writing practice. At first I wrote and workshopped stories--traditional stories both in terms of length and narrative. Next I attempted a novel which, after almost a year of work and 80,000 decent words down, I shelved. For my MFA thesis, I submitted the first several chapters of a second novel. I've long since completed that thesis novel, but it's also shelved. I've deemed both novel manuscripts failed and have put them down to practice. I'm now working on a third novel, one I believe will succeed. It's these years at work on longer forms that have informed my short-short stories, as of course has my reading. I know what both the long and the short forms can do. With both the long and short forms, nothing is more satisfying to me than to give the story everything it needs to succeed, and to do so with maximum compression and efficiency. There's a brilliance, an almost brutality, to the best of short-short work that sets me afire. One of the many things I loved about Goodnight Nobody was the way your stories often take characters to the brink of psychological danger – a feeling, an action or a memory that has been secret or painful - through your characters you give voice to things we aren’t supposed to admit we might feel or say – and by doing so, it makes them okay, or at least the expression of them okay. What interests you about exploring these perilous places in your writing? Peril, the peculiar, and people on the brink fascinate me. They also make necessary and interesting material for story. Victor LaValle instilled in me the writer's ethic: Be Interesting. Everything's interesting, even the most mundane, if we render it in strange and unfamiliar ways. What characters can and cannot do or say compels me. I'm always plumbing characters for their secrets and fears. For their actions and inaction. For what they couldn't bear others to know about them. That's where the juice is. Secrets and fears, turning characters inside out: Those are the vibrations thrumming through every great story. You were born and raised in Dublin and now live in San Francisco. Your stories are set in both Ireland and the United States; I was noticing that the stories set in Ireland (and also your blog posts) sound Irish, not just in setting and vocabulary, but also in cadence. Where do you feel most at home, and why? In what ways do the two cultures influence your work, if they do? Both my parents died recently and I brought back from Ireland to San Francisco their house key. The key sits on the altar in my office and is precious. The key represents home, and in particular the search for home. Despite many good reasons why I should, I still don't feel at home. Now, all childish hope of ever getting to at home--belonging, acceptance, contentment, and peace--from my parents is gone. There's both loss and opportunity in this, just as there is loss and opportunity in immigration. As an immigrant, I'm split between both countries and cultures and have never felt fully at home in either place. In truth, I've suffered this sense of isolation, of not fully belonging, for as far back as I can remember. Writing, thankfully, gives me a sense of being in the right place and it's a dwelling with many voices--rhythms and cadences that I've stopped attributing to countries or cultures but to the murmurs of my heart. Your mother's death last year was expected, but your father's recent passing after a difficult time in hospital was sudden and shocking; the blog post you wrote about his funeral is incredibly moving. Would you speak to the role or importance that writing has in your life right now? I'm more grateful now than ever to writing and the release it offers. Writing allows me to remember and record, and recover. The writing about my parents, and my dad in particular, is rushing out of me. Writing that mourns both who my parents were and who they weren't. All hopes of who they could be now gone. Writing that is heart's blood. You have authored some powerful opinion pieces, such as a New York Times op-ed piece onreproductive rights and an essay in The Rumpus on degrading portrayals of women in advertising. Not every fiction writer chooses to jump into public conversation around political or social issues- what compelled you to speak out on these topics, and do you think other writers ought to engage more in public dialogue as well? What issue or topic are you burning to write about next? Writers should only write about what makes them burn. After that, the writer's only responsibility is to write his or her best. As a woman, feminist, mother of two daughters, and survivor of sexual and physical abuse, women's issues make me burn. Right now, my writing is afire with my parents' deaths. Next, I'll return to my novel, the one that's going to make it. Always, whether it be fiction, memoir, op-ed etc., I'll do my best. Many thanks to Ethel Rohan for sharing so generously of herself and her work. 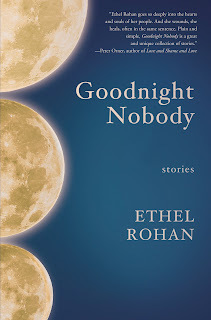 You can learn more about her and her short story collection Goodnight Nobody at Queens Ferry Press and at www.ethelrohan.com, as well as read my review at here on the blog. Photo of Ethel Rohan by John Coen, courtesy of Queens Ferry Press. Thanks so much - so grateful for her beautiful answers to my questions.